This year, Mother’s Day was May 13th and I was leaving for Scotland on May 16th. In a perfect world, my blog post dedicated to my wonderful mom would have hit the internet right on time. In my world, it just didn’t get done. So here is my Mother’s Day post… just one month late. Sorry Mom! Growing up in a small town, no one really traveled that much. Every now and then, I’d meet someone who had really been places: a kid from camp who’s military parents had been stationed somewhere in Asia, a girl in my dance class who went on a church trip to Mexico, a fictional character in a book who was solving mysteries all across Europe before she even hit puberty. That wasn’t me. The travel bug didn’t hit the Taylor household until my sister and I were out of the house. Sure there were pipedream trips to Italy and one fantastic vacation to Mexico, but nothing really big happened until later. I like to think I was responsible for kicking everything off, but in truth, my sister and I were inspired by my mom. I tried to find a picture of the whole family in Mexico, but apparently we weren’t schooled up in using the self-timer function yet so this was the best I could do. It all started on a gloomy day in September. It was the final day of my sorority’s recruitment week we had planned two activities: a sunny-day activity and a not-so-sunny-day activity. We did the latter and went to a movie, Under the Tuscan Sun. It was inspiring. So inspiring, in fact, that after all 80 of us got back to the house, I immediately looked up the show times for my mom’s neck of the woods, called her and told her where the theater was and what time to be there. Since I’m not usually one to bark orders, my mom knew this must be serious, so she complied. That next week I applied for my passport and she and I started researching a trip to Belize and Guatemala for the coming Christmas break. I don’t remember how long we were there, a week or maybe a little more, but I do remember that it was scary, awesome and a big freakin’ deal. Here is my mom on that first trip in Belize. 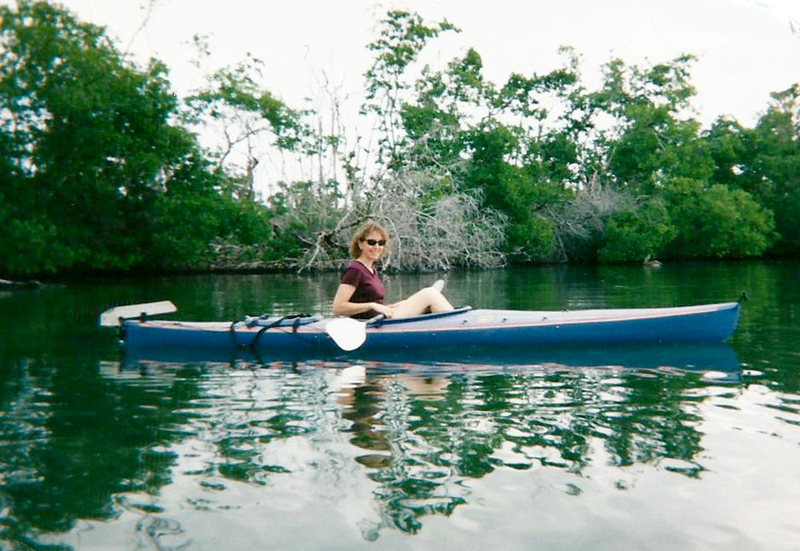 Shortly after this shot was taken, a manatee came up to the surface between our two kayaks. It was terrifying. We didn’t take this photo, it’s from Wikipedia, but we could have taken a similar one had we not been freaking out. And yes, I know manatees are gentle giants, but at the time it seemed more giant than gentle. Instead of boring you with those details, here is a list of things that you might think or do on a first trip and then thoughts on those same topics after a bit more travel experience. Then: What if there are no ATMs and we are stuck with no money?! We’d better get some travelers checks. Now: What are travelers checks? No seriously, what are they? Then: Today we are spending the morning at X-museum, lunch at Y-restaurant and the afternoon exploring Z-attraction. Now: Let’s see where the day takes us! Then: We’d better plan ahead and book all our lodging, transportation and excursions in advance. Ack! Why aren’t these tiny places emailing us back?! Now: Small village? Developing country? No way do most of those places have online booking. Let’s wing it and save some money. Then: A lizard in the room! Let’s ask the guy next door to catch it and get it out of here! Now: Par for the course. Then: I’m going to pack short-shorts and belly shirts because I’m 19 and not going to bother reading up on what the locals deem appropriate. Why are all these guys hooting and hollering at me?! So rude! 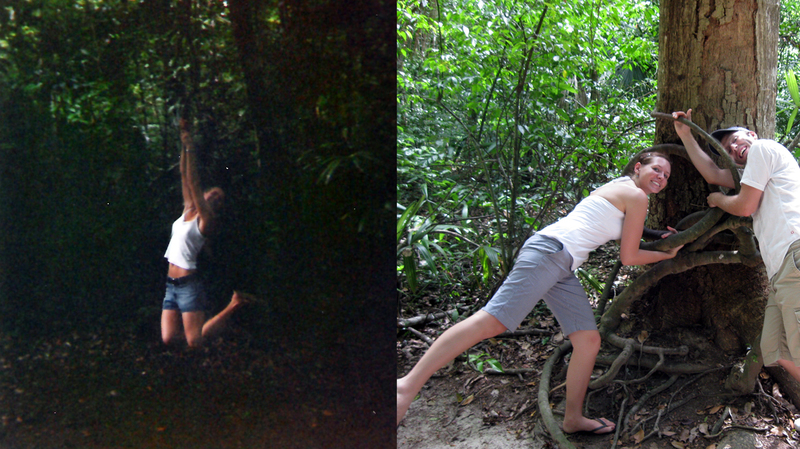 Left: Me in Tikal circa 2002. Lots of leg and lots of stomach = lots of attention. Right: Me in Tikal circa 2009. Longer shorts and a longer shirt = just right. Then: Oh no, we have part of our trip booked in Guatemala and all these Belizeans are telling us it’s dangerous…. Fast forward three days… Guatemala is fine, but how weird is it that all these Guatemalans are telling us Belize is dangerous. Now: People everywhere fear the unknown. Now: Too costly, too heavy and too worthless. Well-thought out, quality and useful items are the best kind of souvenir. Also, why on earth would your friends or family want something from a place they’ve never been? I’ve never understood that one. To all my friends and family who might feel differently, sorry I’ve never brought you anything back from my travels! Now: Packing List = thoughtfully planned items and the knowledge that if I run out of something like AA batteries or shampoo, I can easily buy more anywhere. Then: This is so freakin’ amazing! In short, we used to over-think, over-prepare and worry way too much. Nowadays, in travel, we’ve learned to go with the flow and that you can’t (and shouldn’t) plan everything meticulously because where would the fun be in that? That trip, the first in a long line of trips, was amazing. We played in the warm water of the Carribean, we hiked the massive Mayan towers in Tikal and we explored jungles, ruins and foreign villages. It was that trip that inspired my mom to spend the next three years of her life further exploring Central America. Her eagerness to conquers all those stresses listed above was inspiring. Her fearlessness to set out and try something new was a motivation for my sister and I to do the same and her willingness to do it all by herself and on a limited budget should encourage everyone to get off their duffs and buy a plane ticket already. 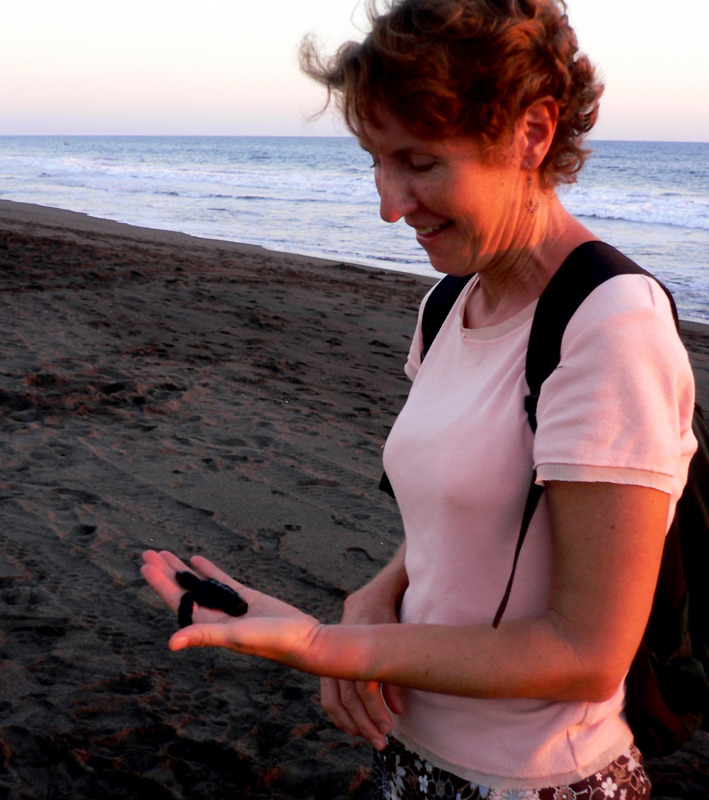 Getting ready to set a baby sea turtle free in Monterrico, Guatemala. These are the black sand beaches I talked about here. See, I should have known better the second time around. In Granada, Nicaragua. Rocking chairs are really big there. Seriously. It’s really hot there, we spent a lot of time rocking and watching the world go by. 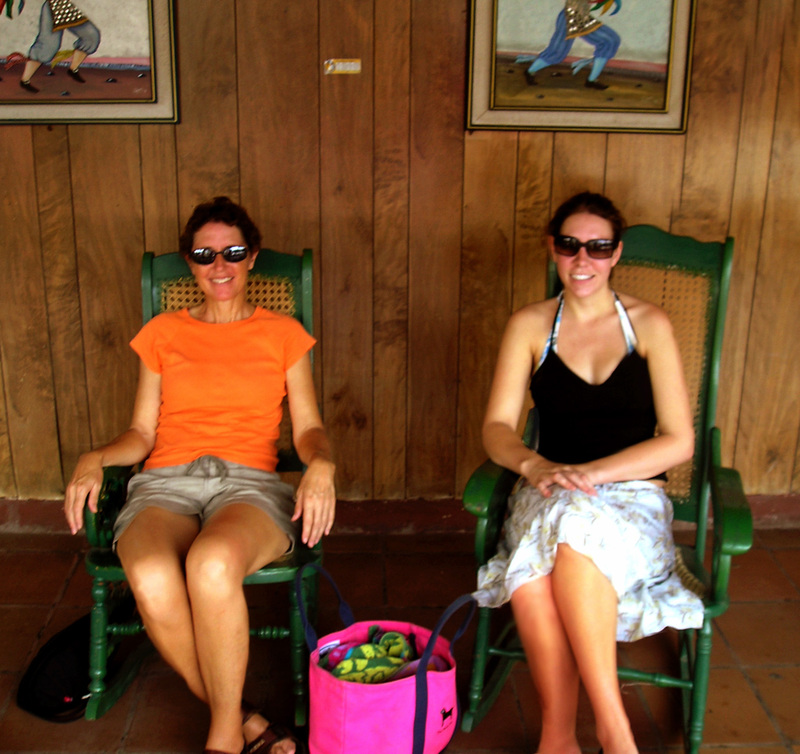 A picture from that first trip to Belize… Mom and I on Laughing Bird Caye during a day of snorkeling. 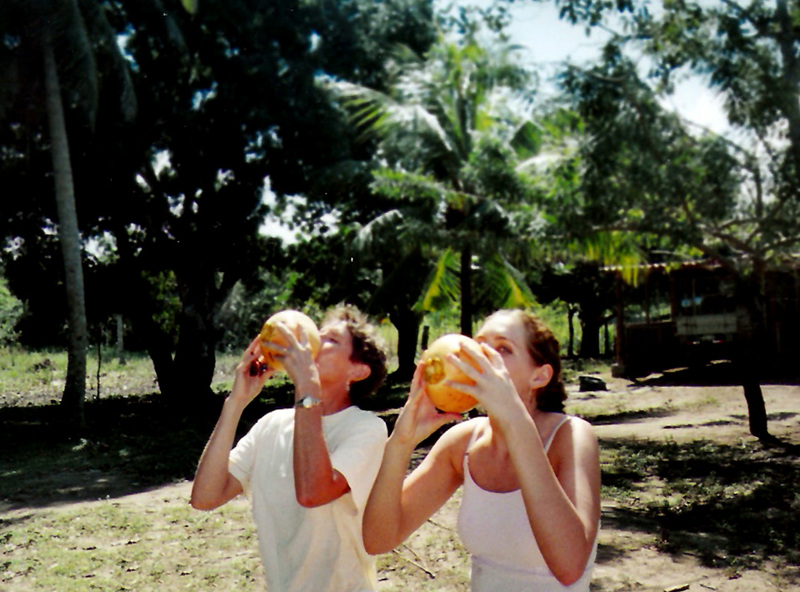 My mom and I drinking out of coconuts in Honduras. ← Travel Tips & Tricks: Get in the picture! I certainly agree about the souvenir thing. Earth is sufficiently globalized and if friends or family want something from somewhere then they can probably just get it online. Still, I’ve had many an argument with U.S. customs personnel who don’t believe me that I’ve been to 20 odd countries over the period of a year and don’t have anything to declare. I’ve started writing things like toothpaste and mascara just to make them happy.